I’m really pleased to have been chosen as a Merlin Annual Pass Blog Ambassador for the third year running. 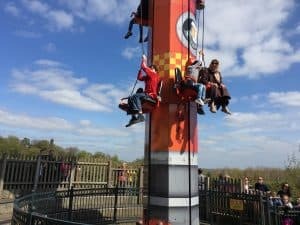 We live very close to Thorpe Park, and having the Annual Passes means that my two children (aged 14 and 12) can be just about set free to run riot there over the summer. But being a blog ambassador is about much more than just letting your children go regularly to the park of their choice. 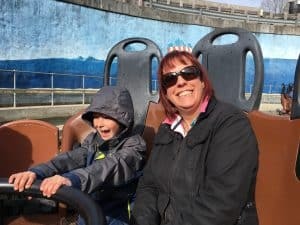 We have a huge number of Merlin attractions within easy reach of us, and we plan to visit them all this year, plus make a few trips to places that are a bit further afield. One of our local attractions has fallen out of favour a bit with my children. 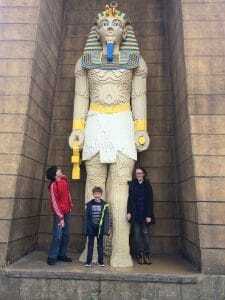 We have had huge fun at Legoland over the years, but now they are older (14 and 12), they feel like they have slightly grown out of it. 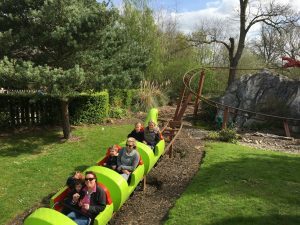 The rides are a bit more tame and the attractions are a bit more suited to younger children – especially those that love Lego. But I was delighted to hear that my 8 year old nephew had received a Merlin Premium Annual Pass for his birthday this year, and he was absolutely over the moon at the prospect of visiting Legoland at Easter. When I told him that his cousins would come too he could hardly contain himself. Teenagers are a funny bunch – they love to pretend that they are ‘too old’ for something. But take them to an attraction with a child of the ‘right age’ and they can revert to childhood very quickly. Of course they were doing it all ‘for Charlie’s benefit’ and they weren’t really enjoying themselves…..or were they? I really enjoyed going back to Legoland too. Do you know that bit when you’re a mum and your children grow out of something and you really miss it? Well Legoland is one of those for me. My nephew has a completely different temperament to my two. With them it was always all about the rides. 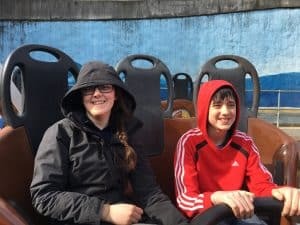 they were thrill seekers from an early age, and that is why they quickly graduated from Legoland to Chessington World of Adventures and then to Thorpe Park. Legoland was discarded, and I was sad to see it go. Charlie on the other hand was really taken with the Lego City. He loves Lego and took quite a lot of time to marvel at the buildings that were taller than he was and the model trains and boats that move (not to mention Tower Bridge). 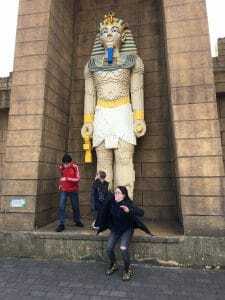 Egged on by him, all of the children were amazed by the giant Egyptian mummy statues and happy to have their picture taken. And then they all jumped and screamed when the statue suddenly let out a roar. I’ve never seen my (very cool) 14 year old daughter jump so high. One of my best funny mummy moments…. 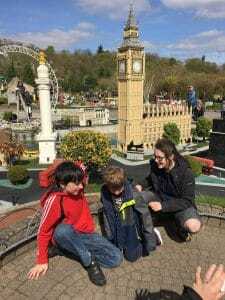 After we looked at the Lego we managed to persuade Charlie (and his mum) to go on the Dragon’s Apprentice (mini roller coaster) while my two went on the Dragon (bigger roller coaster but not scary) by themselves. I got to stand out and take photos – benefit of the children being older…..
And so finally to the Space Tower, a clever contraption where you sit in pairs and use a (heavily machine assisted ) rope to pull yourself up a tower, and then let go and fall down (also machine assisted so you don’t fall heavily). parents (particularly dads) were having all kinds of fun with their children on this one, and my 12 year old son stepped up and showed his cousin what to do. We also got free parking at the venue with my sister’s Premium Merlin Annual Pass, but not access to the Priority Car Park. This has changed since last year and wasn’t very well signposted, but it wasnt a big deal. I felt sorry for the car park attendant turning all the Premuim Passholders away – not a fun job I suspect. I think my kids are going to have fun with their Merlin Annual passes this year, now that they can chaperone Charlie. Chessington World of Adventures and Sea World beckon, not to mention Shrek’s adventure (something else which my two have really grown out of). Will Charlie manage the London Dungeon? Will I? Watch this space.